El Nino is the cyclical warming of the surface temperatures in the Pacific Ocean at the equator. This type of ocean temperature change (like its opposite La Nina), occurs in irregular periods, usually every few years to create global weather patterns. Following these guidelines and protect yourself, your family and your home during this rainy season. Make a disaster kit that is portable in case you have to evacuate. Keep valuables, documents and medicines in one place for quick access. Have a car ready to go with at least half a tank of gas. Have a family communication and re-unification plan. If on foot, do not attempt to walk through floodwaters. Go directly to higher ground. Six inches of swiftly moving water can sweep you off your feet. Keep children and pets away from floodwaters, storm drains, and sewers. Never drive into a flooded area. Most cars can be swept away by less that two feet of water. If you car stalls and water is rapidly rising around you, immediately get out and move to higher ground. Stay informed of weather predictions and road closures. Inspect your roof for leaks and have them repaired immediately. Clean out rain gutters, downspouts, and roof drains. Report any flooding to the Park Manager. When it comes to watering the yard, you may be able to save yourself some green without your lawn turning brown. How much should you be watering during the cool season? Not much! As a matter of fact, shut off the system and only turn it on if the garden has gone without rain for more than two weeks. Remember no watering during rain or 48 hours after rainfall. Harvesting Rainwater with Rain Barrels s another way to save this season. 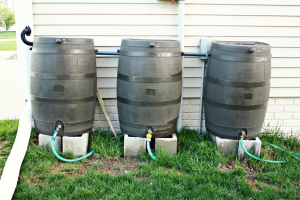 Contact your local water company for possible rain barrel rebates.